I always keep white chocolate in my cupboard to have on hand but I normally don’t use much of it. My go-to chocolate for baking and snacking is super-dark chocolate with 70% cocoa content. As a result, the white chocolate in my cupboard sometimes needs to be, well, used up. That’s how I came up with this hilariously easy and ridiculously tasty Valentine’s treat. Essentially it is a novel take on the Amazing Greek Yogurt Chocolate Mousse I posted a couple of years ago and which, I just learned on Google, seems to have made the rounds on the Internet. My new creation is creamy, surprisingly light, and winter-white which is fitting given the frigid weather we had all weekend, with the coldest temperatures in Boston since 1957 (!). I tried this dessert for surprise dinner guests last week. My plan was to just swap dark for white chocolate for a quick and super-easy treat. But, as it so often happens, straight swaps do not always work in the kitchen. When I tasted the creamy mixture, I found the sweetness of the white chocolate overwhelming, almost cloying, even though I had used a high-quality brand. So I added 1/4 cup more Greek yogurt. Lucky me, I was in a huge hurry, this turned out splendid. The small addition of yogurt created the perfect balance: not too sweet with a nice rich tanginess from the yogurt. I recommend that you properly chill this lush silky dessert for at least 2 hours—even though I found it hard to resist and wait. 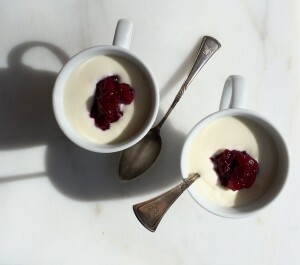 The first time I made it, I dolloped each serving with a quick cranberry compote, prepared last minute with frozen fruits leftover from the holidays. But a few fresh raspberries or blackberries, or a spoonful of bittersweet orange marmalade, as a topping would be just as good. I have since made it again, to be sure it works, and we have been eating it all weekend—in the name of science, of course—while all cooped up inside the house. Enjoy this Icy Winter Valentine, and let me know what you think. 1 Put the chocolate into a medium bowl. Add the whole milk to a small heavy-bottom saucepan and bring just to a boil over medium heat. Pour the hot milk over the chocolate and allow to sit for 2 minutes. Whisk until you have a smooth thick liquid (all the clumps will dissolve, eventually), then add one tablespoon of Grand Marnier. 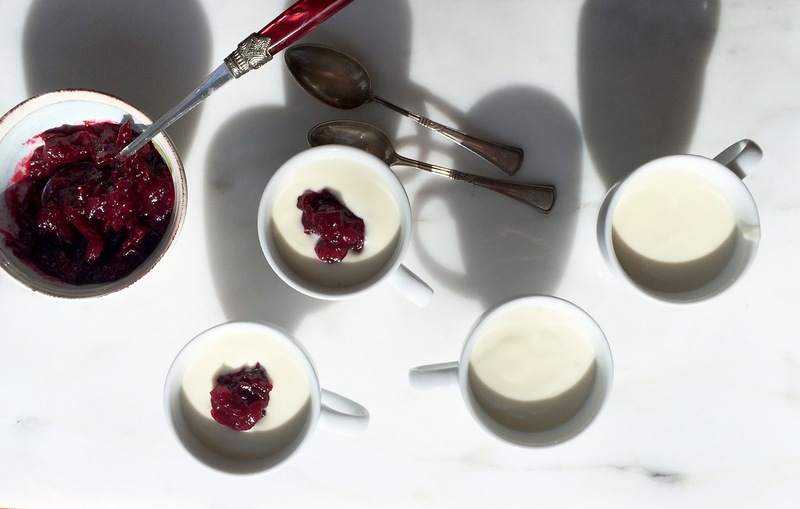 If you like a boozy dessert, add the second tablespoon. 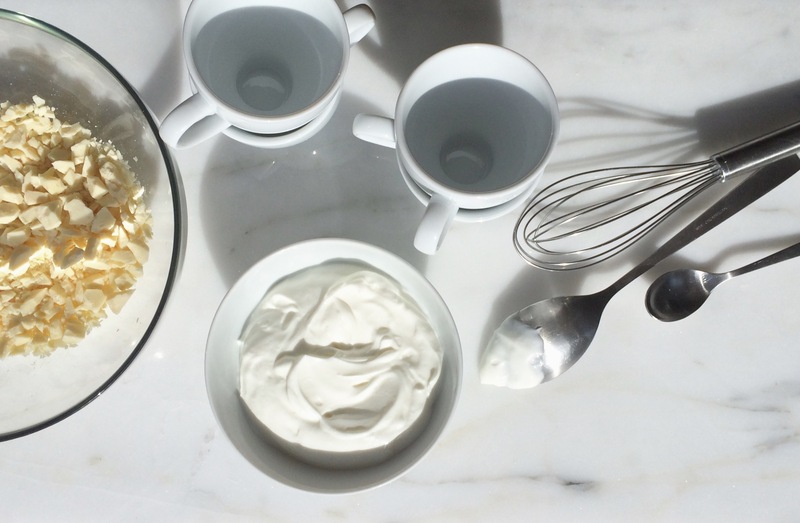 2 Spoon the Greek yogurt into a small bowl and beat, using a fork, until smooth. Add the yogurt to the chocolate mixture and whisk until thoroughly blended. I like to transfer the creamy liquid into a 2-cup-measuring cup so it can be easily distributed. 3 Pour (or spoon) the mousse into 4 small serving cups or bowls and chill for at least two hours, or overnight, so it can firm up. Garnish each serving with a few berries or 2 teaspoons of marmalade. Greek yogurt: Many of the widely available brands of Greek yogurt in the US have little of the characteristic flavor and tanginess that I cherish and consider essential to this dairy product. I recently tried the new organic Whole Foods brand, and was surprised how much I enjoyed it. I find it more appealing than the Greek Fage brand which I have recommended in the past.